The small streets are jammed with traffic. People on foot, on bicycles, with carts, with trolleys, men with huge boxes on their heads, men with straps around their heads securing huge loads to their backs who march along with eyes down. It’s a case of get out of the way or be crushed. I think I am the only white person in the vicinity, and the only woman in this frenetic artery of jostling, urgent activity, but apart from being run over or a foot being crushed, I am not scared. 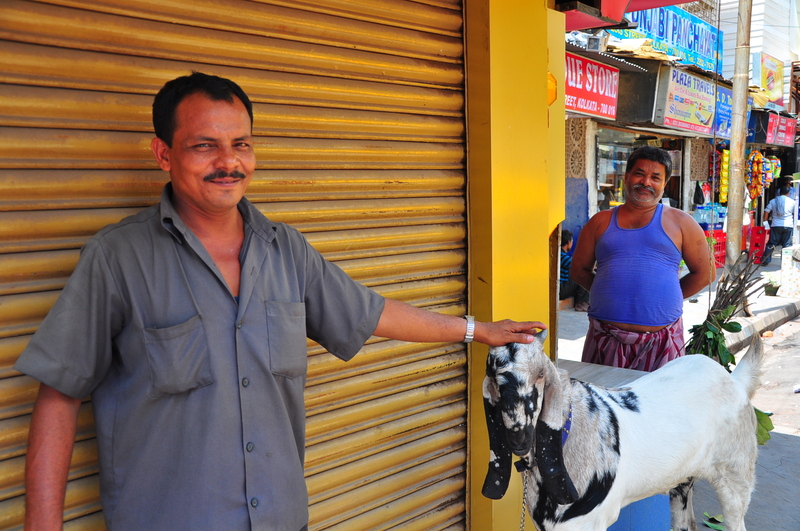 Men – not many women here – are staring at me, but they don’t care I am there. As long as I don’t get in the way. 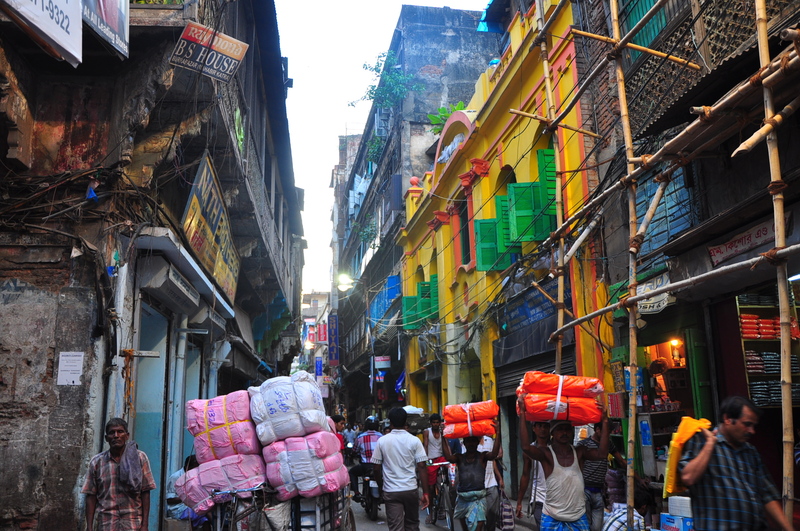 With around 15 million inhabitants, Kolkata is a monster of a city by any standards, especially when you add in its struggling infrastructure, overpopulation and continuous flow of poor immigrants looking for work and a new life. The noise, crowds and desperate poverty are to be expected. I also expected to be overwhelmed by Kolkata. But I wasn’t – not at first, anyway. Sure it was crowded, and a bit ramshackle, but you can say that about a lot of Asia. Then I walked further north towards the landmark Howrah Bridge – one of the busiest in the world – which spans the mighty Hooghly River. As i get closer the traffic is getting heavier and heavier – I’ve never seen so many buses in one place in my life. I end up on an overpass with one bus after another rumbling past me, which is slightly alarming, but does give me a great view of the busy thoroughfare pictured at the top (I think it’s Mahatma Gandhi Rd). I think I’ve found what you could call the busy, overwhelming Kolkata. When I get down from the overpass I am stranded on a traffic island with a few other people who need to cross to one side or the other, and it’s not easy. Indian traffic makes no allowances for pedestrians and along with the fumes and the noise, you can feel the frustration and the exhaustion of drivers who have just had enough. Then I walk onto Howrah Bridge, watch the phenomenal flow of vehicles and take a few photos before I realise I’m not supposed to. 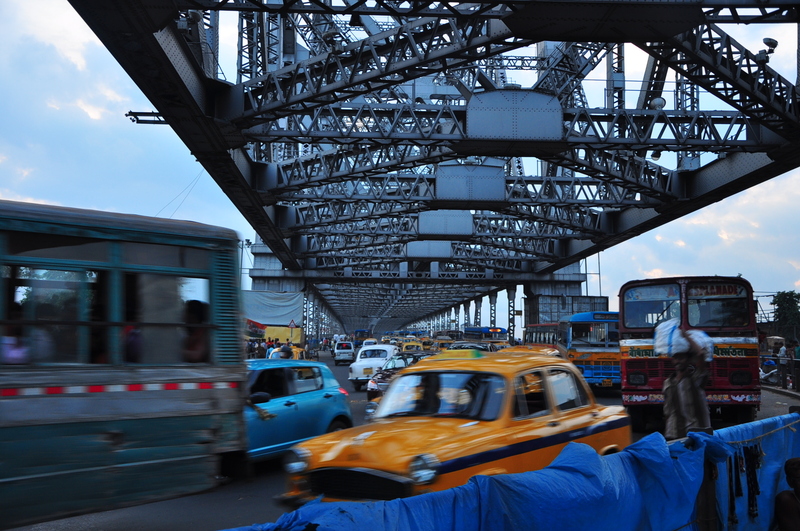 Kolkata is surprisingly easy to navigate – I may not know what street I am on, but I never lose my sense of direction. On my return trip the traffic gets even heavier, if that is possible, and I walk along the road hugging the river bank (from which you can reach the flower market), where hawkers are cooking in amongst puddles, cracked cement and people, people, people. It’s tiring, but fascinating. I can’t imagine though what it is like to have to deal with this every day. There’s only so much bus, fumes and honking I can cope with though, before I cross to a street market, buy some mangoes and find a quieter thoroughfare back to where I am staying. When I stop off to look at the magnificent GPO, a man asks me what I want, and I think he is going to tell me to get lost, but he takes me inside, helps me buy some stamps and makes a little paper packet for me to store them in. Bless. 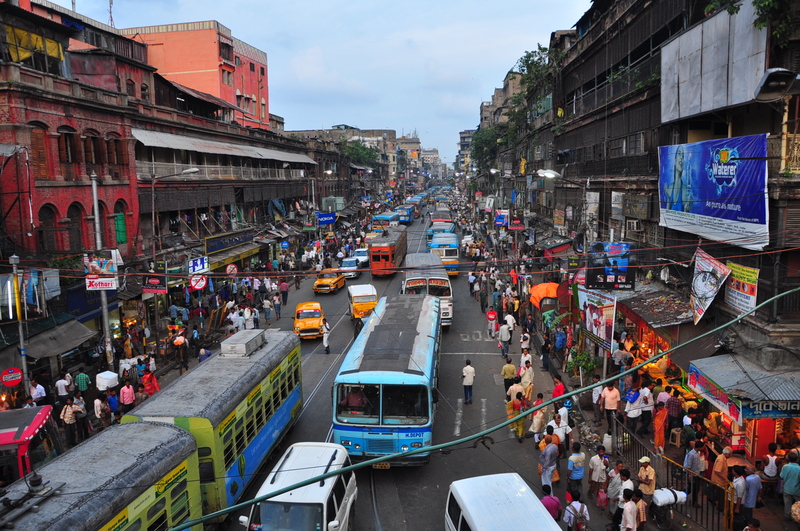 Considering the stress of such a busy urban environment, the people of Kolkata are remarkably even-tempered. I can see why they need to honk a lot though – in the circumstances it’s a fairly harmless outlet for what must be at times a mighty urge to scream. A more serene outing is to be found at the Victoria Memorial Hall, an impressive pile of white neo-classical marble inaugurated as a tribute to the former Empress of India in 1921. Housing paintings, sculpture and lots of information about Kolkata history and personalities, it’s one of those places you can whiz through quickly or pick through over a day. I went on the weekend and it was full of Indian tourists who also buy snacks at the stands on the road outside and clatter up the street in horse-drawn carriages behind kids on ponies fancying they are reliving the Wild West. My favourite chunk of information regarded Philip Francis who lived in Kolkata in 1775. His household required 110 servants to look after the many needs of … four men. Moving along, my favourite name in the museum section belonged to young Indian medical student who won a gold medal for comparative anatomy around 1840 in London and went by the name of Soojjee Chuckerbutty. Not far from the centre of town, the park surrounding the monument is greenly inviting and nicely laid out. After posing for photos with some young Indian men, my work at the memorial was finished and I could walk back into town availing myself of fresh juice and lassis at the stalls lining Chowringhee Rd near the Indian Museum. The Indian Museum is a treat for anyone who likes stuffed animals, and it has some deformed goats in jars. The highlights are probably the sculpture, and the reconstructed 2nd century Barhut Gateway in Gallery 2, from a site in Madhya Pradesh, Central India, known for its early Buddhist stupa and artworks. The geological gallery looks like a chaotic jumble of stones, which seems in keeping with the character of the city, and one corner of the complex smells of wee, but the central courtyard is quite serene and the building is grandly colonial. And after the crowds outside, the museum (closed Monday) is quite restful. Looks like a really busy place!